There is always something going on at the Wongai Beach Hotel! This entry was posted on July 29, 2014 by administrator. WEDNESDAY NIGHT IS PARMY NIGHT AT THE WONGAI! 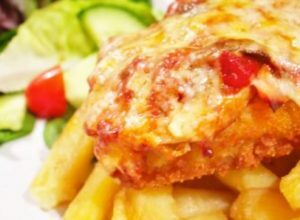 Come down to the Wongai Beach Hotel on a Wednesday between 6pm – 8pm & grab yourself a mouth watering Chicken Parmy, Chips & Salad (selected beverage included!) – all for $26!